Kind of a no-brainer IMO. Fortune doesn’t mention it but Musk has taken to social media and direct communication with the public unlike any CEO and certainly any Car/Aerospace CEO of our time. His honest and often overly transparent views have managed to turn media controversy into positives for the company. Also throw in the fact that he’s CEO of two game-changing companies and the Chairman and largest stakeholder of another: Solar City….and if he wasn’t so busy, he’d be building a ultra high-speed hyperloop train connecting Los Angeles and San Francisco. Also he doesn’t seem to be too terribly pretentious..and there you go. It is no Secret that Elon Musk is a triple threat: The co-founder of PayPal has gone on to disrupt aeronautics with Space Exploration Technologies, known as SpaceX; shake up the auto business with Tesla Motors; and retool the energy sector with SolarCity. (He is CEO of the first two companies and chairman and largest shareholder of the third.) 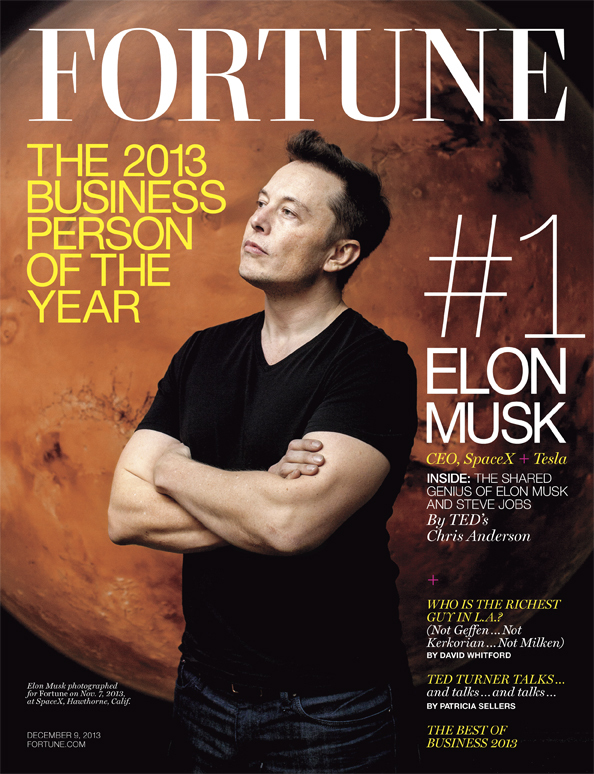 But 2013 was an especially notable year for Musk, as investors and consumers wholeheartedly embraced his ideas and vision. After a rocky start a decade ago, Tesla has emerged to become the world’s most prominent maker of all-electric cars. Revenue at Tesla is up more than 12-fold for the first three quarters of the year, and the company is on track to top $2 billion in sales in 2013. The stock is up more than fourfold year to date, and that’s after giving back some gains when recent vehicle sales missed some analysts’ estimates. (A series of troubling car battery fires has not helped.) And just as SpaceX has helped reignite interest in space exploration, Musk’s plans for a “hyperloop” between San Francisco and Los Angeles got Americans buzzing about ultra-high-speed transit when Musk released his design plans in August. Musk’s creations have already made him tremendously wealthy — Bloomberg Wealth says he is worth $7.7 billion — but it is his audacity and tenacity that make him Fortune’s Businessperson of the Year.